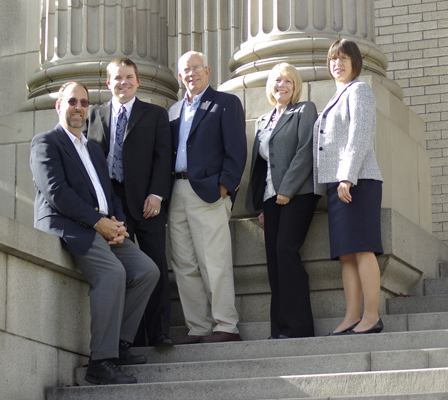 When it comes to accounting and tax services in the Columbia River Gorge region, Friend & Reagan, P.C. has stood the test of time. Our roots date back to 1946, when our founder, Leonard D. (Dude) Baily first started serving clients in and around The Dalles, Ore.
After Dude took on additional staff and groomed a select few to become new partners, the business evolved—and so, too, did its name. For many years, it was known as Bailey, Clark and Byers. However, as additional partners were raised in the ranks and the founding fathers retired, our name was changed first to Byers, Neumayer & Bradford P.C., then later to “Friend & Reagan, P.C.” to better brand its current co-owners, Carol Friend, CPA and Nate Reagan, CPA. Working together, Carol and Nate lead a robust staff of 11 thru tax preparation, audit, payroll & bookkeeping services. Over the past 70+ years, our firm has earned a reputation for serving a diverse clientele. Without a doubt, we are the go-to accounting and tax management resource for a large number of agricultural clients. However, Friend & Reagan, P.C. also takes pride in servicing thousands of organizations in a variety of sectors—everything from healthcare to government, nonprofit, retail and many others. As well, we specialize in helping small business owners and individuals. Regardless of where they’ve worked or lived over time, many such clients have remained loyal to Friend & Reagan, P.C., making us their firm of choice for accounting, tax help, bookkeeping, payroll, audits/compliance support and more. Meanwhile, with today’s cloud-based technologies making accounting and taxes easier to manage and access securely, we’re thrilled to be moving in a direction that enables us to better focus on customizing our clients’ experiences. We’re also committed to developing our staff to reach its full potential while growing our current portfolio of bookkeeping and payroll support. Above all, Friend & Reagan, P.C. strives to remain a reliable, trusted partner both for our clients and the greater community throughout this generation and the one to come.